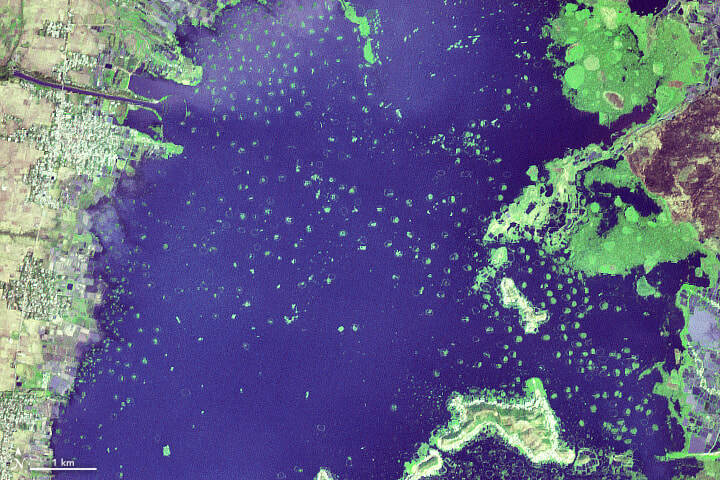 Loktak Lake is not only the largest freshwater lake in northeast India, it is also home to unique floating islands called “phumdis.“ These circular landmasses are made of vegetation, soil, and organic matter (at different stages of decomposition) that has been thickened into a solid form. The islands have a spongy surface that feels like a trampoline. Like an iceberg, most of the mass of phumdis lies below the water surface. During the dry season, when water levels drop, the living roots of the islands can reach the lakebed and absorb nutrients. 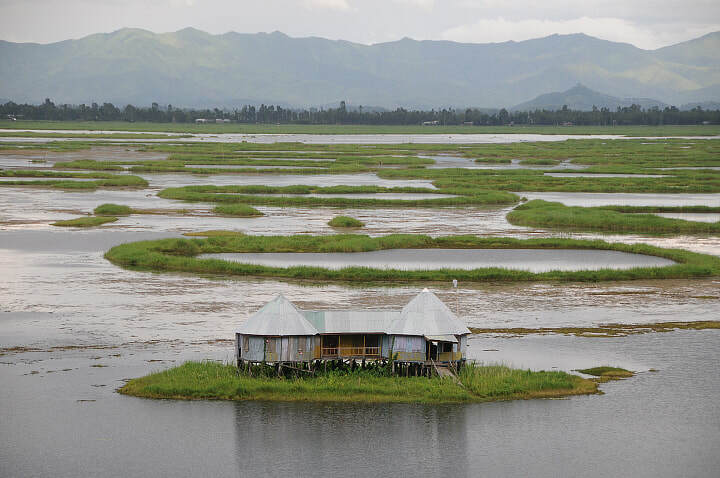 Speckled across this Loktak Lake, the several thousand phumdis and its surrounding waters are vital for irrigation, drinking water, food supplies, thus the lake has been referred as the “lifeline of Manipur“ state. Thousands of fishermen make their livelihood in the waters, catching about 1,500 tons (6.6 million pounds) of fish every year. Children and illiterate adults also attend a school located on one of the floating islands. ​The phumdis support around 200 species of aquatic plants and 400 species of animals, including the rare Indian python. The largest island is home to the Keibul Lamjao, the world’s only floating national park. It serves as a habitat for the endangered brow-antlered sangai, or "dancing deer," whose hooves have adapted to the island’s spongy ground. The park, covering 15 square miles (40 km2), was specifically created to preserve the deer, which were once thought to be extinct.The habitat is composed of floating meadows and a raised strip of hard ground that separates the park into northern and southern zones. The construction of the Ithai Dam in the 1980s — built to provide power for India’s northeast states — has threatened the life of the islands. The dam south of Loktak Lake has caused water levels to remain high year-round, preventing the phumdis from sinking and reaching the lakebed for nutrients. As a result, the phumdis are slowly thinning and breaking apart. 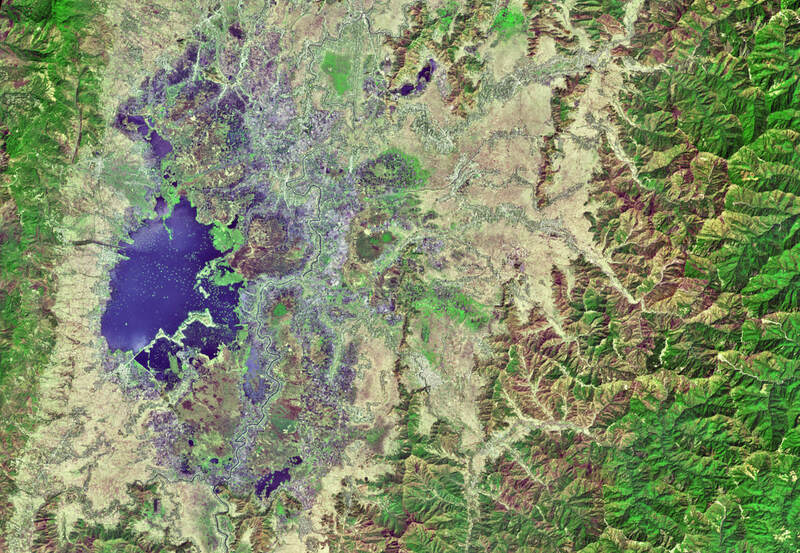 The top satellite images of Loktak Lake were acquired on March 19, 2018, by the Advanced Spaceborne Thermal Emission and Reflection Radiometer (ASTER) on the Terra satellite. BBC Travel (2018, April 12) The world’s only floating national park. Accessed May 4, 2018. Pulitizer Center (2017, December 1). 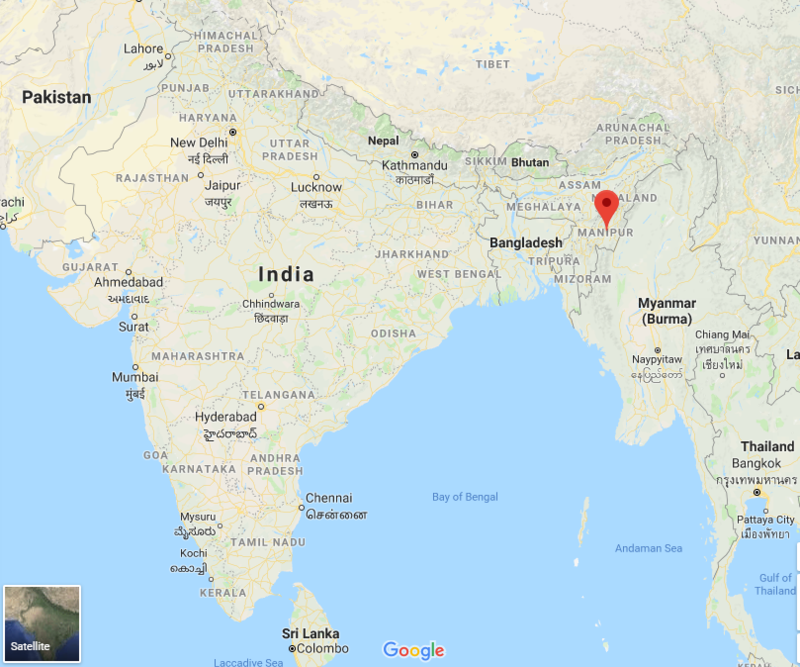 Manipur: Ithai Dam Threatens the Loktak Wetland. Accessed May 4, 2018. Condé Nast Traveler (2012, August 15). The Shifting, Endangered Islands of India’s Loktak Lake. Accessed May 4, 2018. World Heritage Convention, UNESCO (2016, November 3) Keibul Lamjao Conservation Area. Accessed May 4, 2018. 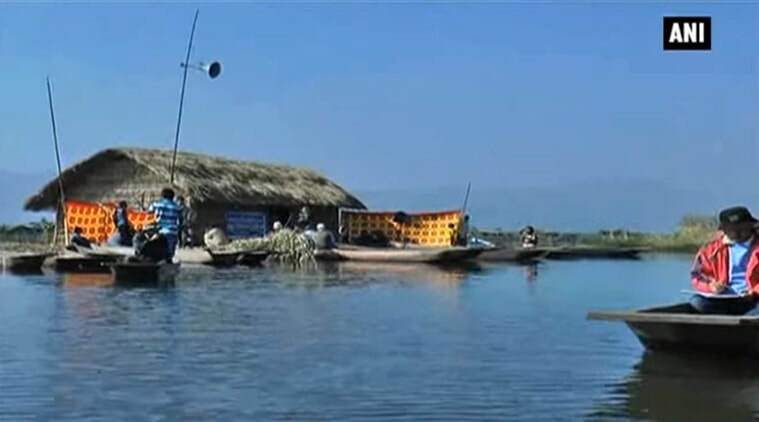 Northeast Tourism Loktak Lake. Accessed May 4, 2018.